Montecristo White Vintage hand-rolled premium cigars are expertly constructed with Vintage 2008 Connecticut Shade Wrappers. Every leaf used for these premium cigars are grown in the Connecticut River Valley, where special tenting is used to filter the sun and elevate humidity levels to perfect growing conditions for these fine and robust tobacco blends. The results produce a silky texture, and golden appearance to each cigar that delivers delicate flavors of vanilla, hazelnut, and espresso finished off with an even flawless burn. 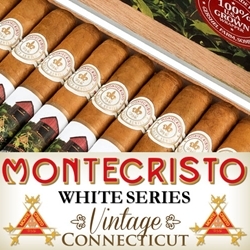 The Montecristo White Series Vintage Connecticut selection are designed to appeal to all kinds of cigar smokers. Smokers Discounts has made it easy and affordable to buy premium cigars online. A variety of sizes and flavors are listed below at our online cigar store. Each of these styles are in stock and available at a low discount price. Call us for more details!